For the past few weeks I have been ordering some of the parts mentioned in the previous toolbox post for the construction of the toolboxes. I've come to regard them more as a portable workshop than simply toolboxes and more of the reasons for that will be shown in the development sketches. I also completed a model and set of renders which I'll share in the next post along with some of the analyses conducted to determine the cutting lists, parts requirements and other technical aspects of the construction of the boxes. This first sketch really has more to do with the evolution of the shave moose than the toolboxes. I thought I'd include it here as this was an earlier idea than the toolboxes, however it has had a significant impact on the form of them. From initial inception the toolboxes have been designed as a means to produce the rocking chairs I've also written about previously. As such a shave horse will be required to produce most of the upright parts of the rocking chairs. This sketch mostly deals with the rough form of the horse though it later contributed to the form of the overall box. with allowances made to accommodate such a tool, which have been subsequently changed to accommodate the much more compact collapsible shave-moose. This early sketch is mostly notable for the drawer layout as presented in the top right corner. This layout, for one of the boxes, has remained relatively consistent. The top two levels and bottom level of drawers remaining for the same purpose with two drawers added in between to fit longer tools such as sash clamps. 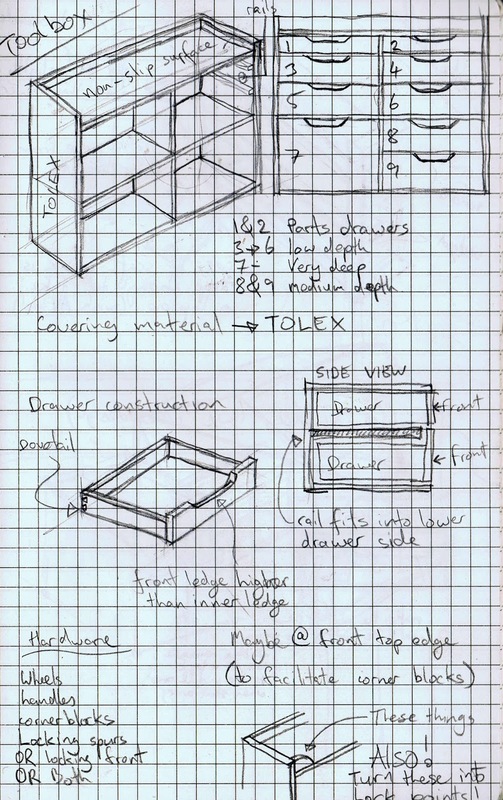 In this sketch can also be seen the early ruminations regarding the construction of the drawers and some small details to be included on the top work-surface of the boxes. The sketch above is again most notable for the sketch in the top right corner which depicts the two boxes in their closed configuration. At this point the lids are only mentioned in the notations despite the fact they have come to form a fairly critical component of the final design. 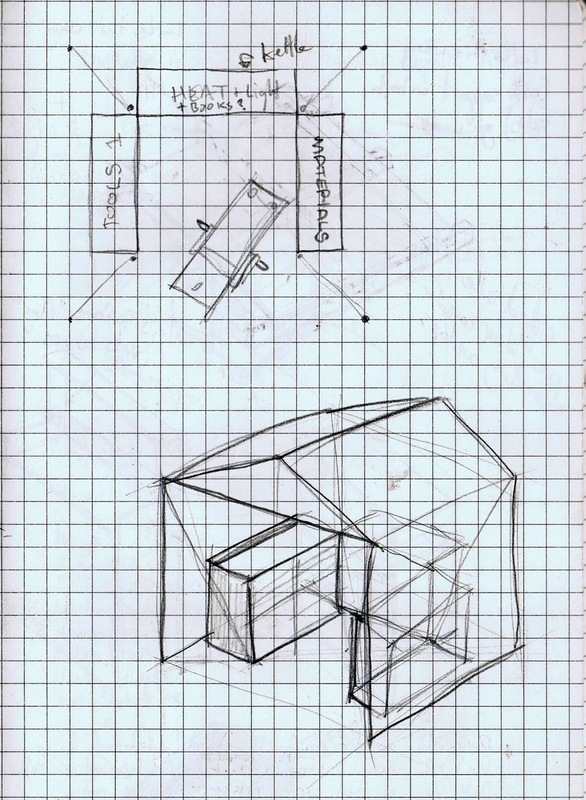 The sketch above is one from a selection of many that shows possible arrangements for the boxes in-situ in an outdoor work environment. 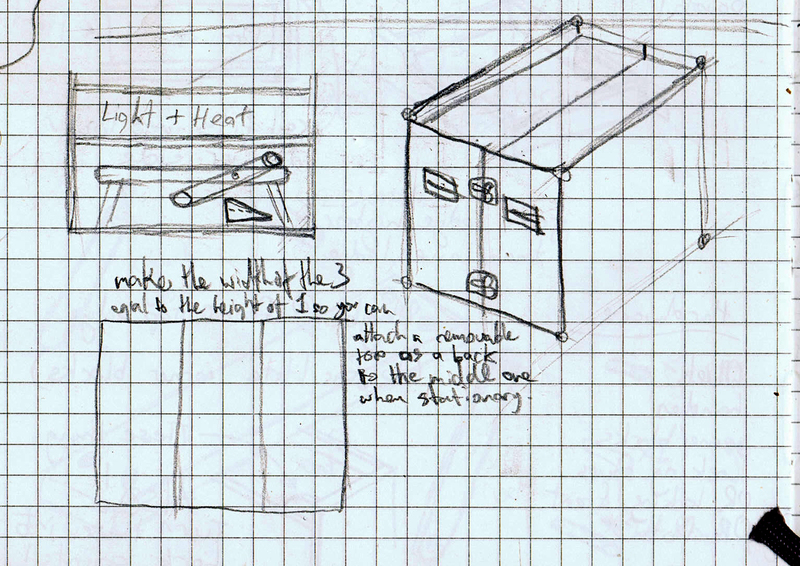 This particular sketch involves a box that splits in three (an earlier idea) and how it might also include fixings for a tent structure directly connected to the boxes themselves. The sketch above shows variations on the arrangement of the drawers/cupboards/spaces in the boxes. I had considered building a three-part splitting box and two two-part boxes but settled on completing the single two-part box initially. 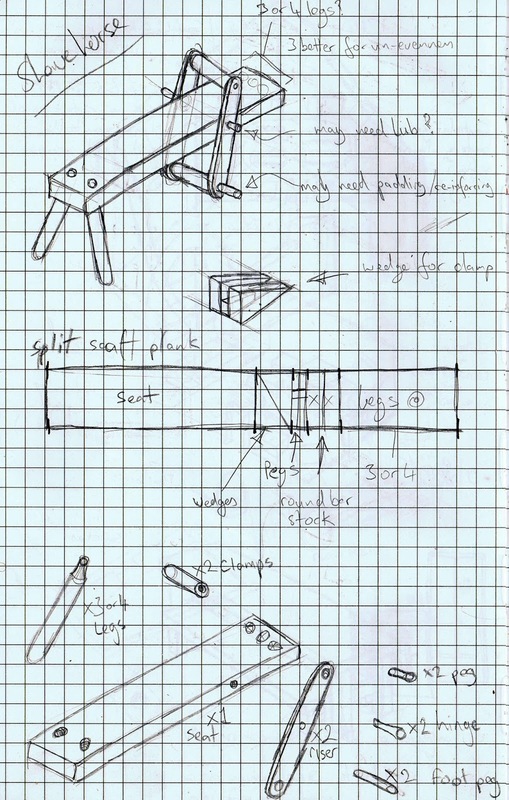 Further development sketches show how the other configurations could be adapted to act as drawing desks or for finer electrical or modelling work. 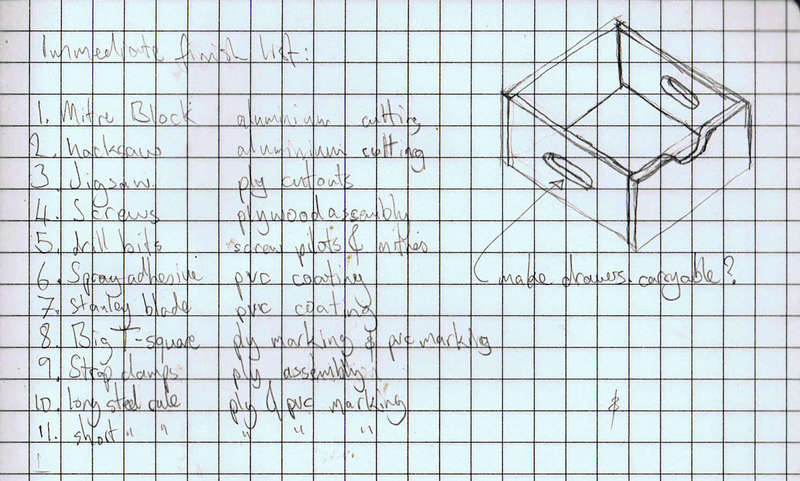 The sketch above is from the a slightly later period in the design of the toolboxes. This shows a few examinations to determine dimensions (on the left) and the construction of the drawers (on the right). While it mainly focuses on the types of joints used in construction it also shows where I done some work on the dimensions of the hand gap on the drawers and the adjustment for the lower set of drawers to allow for the rails for the upper drawers to fit in the box. While the page above shows very little in the way of sketch information I decided to include it as an example of another function of sketch analysis and the design process. These two pages formed the initial guideline to creating the construction specification document which I'll talk about in a later post. 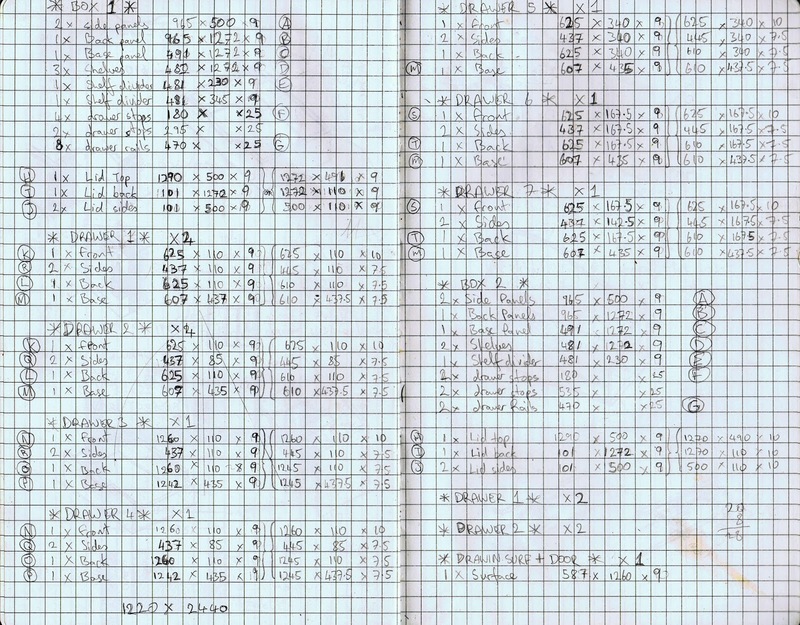 This is essentially manual tabulation, which if you look closely you can see has been modified quite a lot. The working assumption for this point was that I would be working with 10mm ply which has since been more realistically sourced as 9mm ply. This small difference however was automatically accounted for by creating a parts/cutting list which updates itself in Excel depending on the depth of the sheet and the overall dimensions of the boxes among other variables. The above sketch, while fairly mundane, is a good example of a finer and important detail to be worked on later namely a security feature. The top section shows how a simple L-bracket fixed to the inside of the box that protrudes through the aluminium profile can be used a s a means of locking the boxes together. 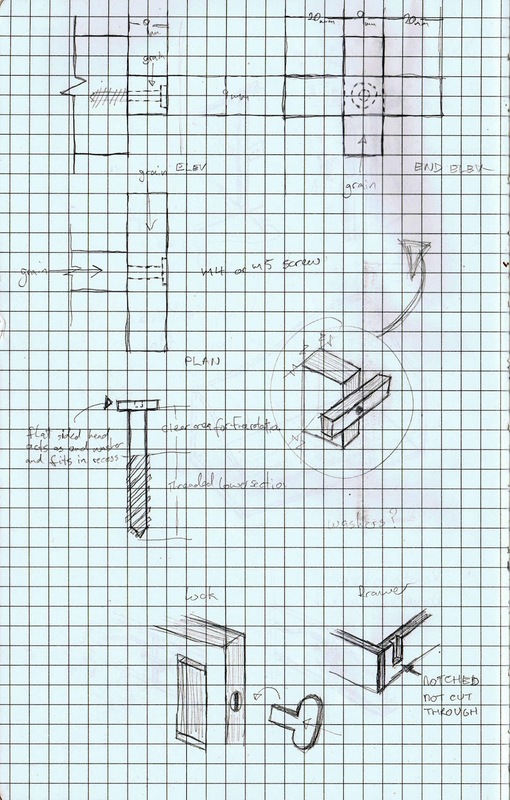 The middle of the sketch shows a ribbing detail which has been updated a lot in later sketches and the lower part of the sketch shows a feature for keeping the drawers in place while being moved which is developed much more in the sketches below. This feature was imagined as a simple outer drawer stop which could be turned to hold the drawers by their front face. Alternatively as shown in the lower part of the page the same retainer function is achieved by means of a slot cut into the side of the boxes and a hidden rotating stop. This feature has been omitted in the final design for a more simple but secure detail at the back of the drawers which will be elaborated on in a later post. 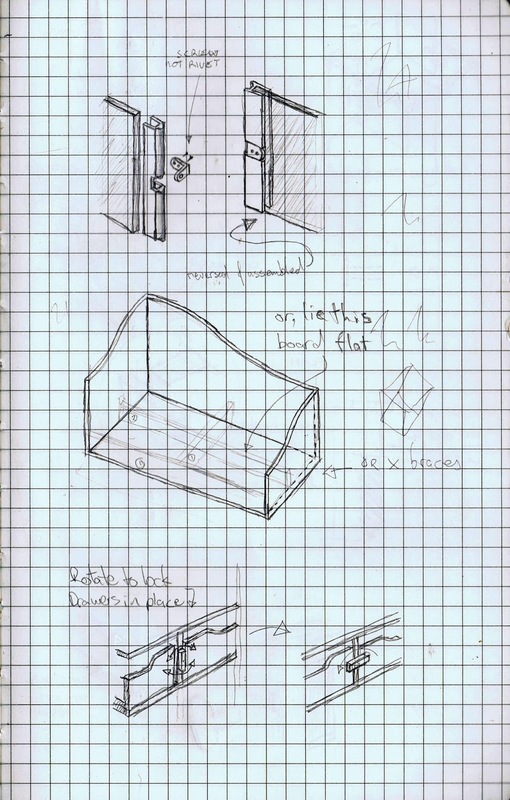 Finally the sketch above shows a very simple but effective detail which would increase the functionality of the drawers in difficult working conditions. By cutting a simple rounded slot in the sides of the boxes, with similar dimensions to the drawer handles, the boxes could be made easier to carry individually. The slots on the side would mean that once the drawers were pulled out to just over half-way they could be handled with two hands much easier as separate transportable units. While the sketches presented above in themselves don't reveal a great deal about the overall design of the cases they show how a simple drawing can be used at various stages of construction to work out details of varying importance. 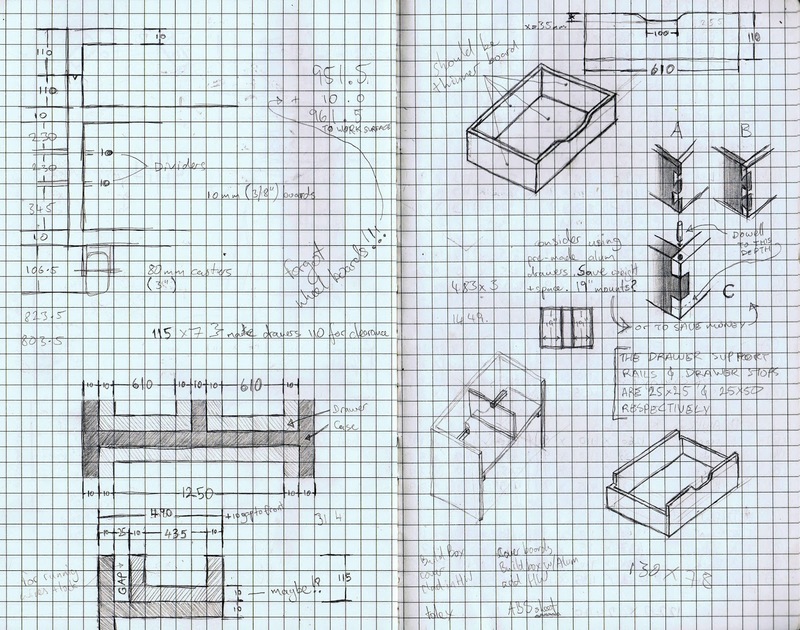 From aesthetics to mechanics to ergonomics the smaller sketches don't just build a clearer image of the functionality of the boxes but also create a sort of temporal map through the design considerations that go into creating a large product like this. 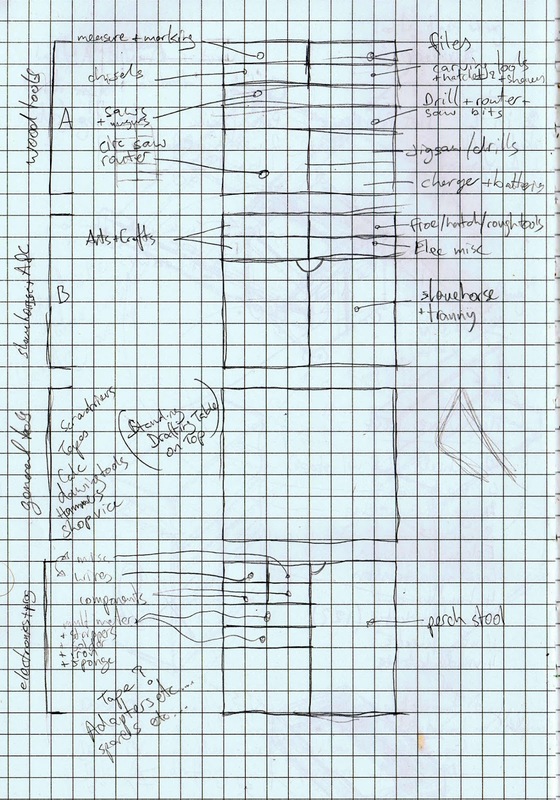 I really believe that sketching like this is an important step at almost every stage from ideation to production to give the designer and producer a firmer grasp of the actual properties both dimensional and functional that will have to be taken into account during the production phase of the final object. I also use sketches as a form of visual reminder. As I tend to work a lot in my head sketching can be a way of simply recording ideas for later recall. It's never a wasted exercise as new ideas can arise in the course of doing the sketches in the first place.